Ask any DC Direct fan: one sure-fire way to piss off action figure collectors is to mess with scale. 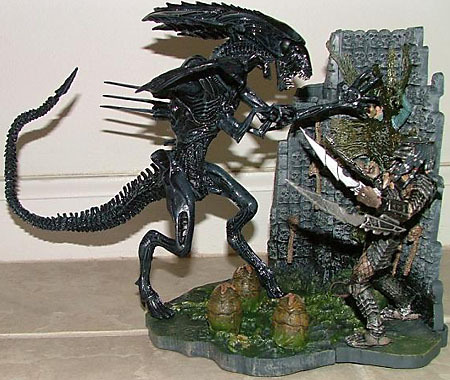 So imagine the backlash when McFarlane Toys announced that its second series of Alien Vs. Predator figures would not be in the style of the 7" highly articulated figures we saw in the first series, but rather - stay with me, now - "playsets" in the 4" scale. The flood of complaints was immediate, especially since there were obvious character choices missing from the first series that many simply assumed would be coming with the second set; most notably, the third Predator, "Chopper," and the Unmasked "Scar" Predator, which McFarlane had initially claimed would be a variant in the first series. When the unmasked fig never showed up anywhere, McFarlane suddenly refused to talk about its status or answer any questions from fans. McFarlane? Ignoring fans? Imagine! So now the "playsets" are here, and fans are still outraged. However, fans also realize that McFarlane still produces some of the best affordable AvP product out there today, and if they tell us Series 3 will be one-inch-tall, completely unarticulated sculptures of a Predator's lower thigh, most AvP fans will still cave in and buy them. I myself was initially outraged at the change in scale and idea, but after having seen them in stores, I, too, succumbed to my desire for new AvP product. I snapped up the Queen Vs. 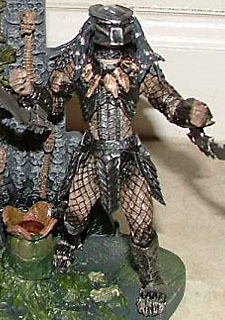 Predator playset, which is actually two different figures sold separately that can be connected via interlocking bases. First off, there isn't much "play" in these sets. "Diorama" would have been a more accurate description. The figures are really meant to stick in the base and stay there, as evidenced by the metal pegs that protrude from the bottoms of both figures' feet. Still, regardless of the flaws in the theme and idea of this line, it's difficult to argue that they don't look nice. Both figure sculpts are based on previous, larger offerings from McFarlane: the Queen Alien is a shrunken, retouched version of the deluxe Queen offered in the Movie Maniacs 6 line, while the Predator is a shrunken, altered version of the Scar Predator from the first series. The Queen is more streamlined, particularly in the area of the massive head crest, to match the design of the Queen in AvP, but it's still a bit off, mostly because it's based on a figure meant to match the proportions of the original Queen design from Aliens. The mouth is open and snarling, which looks pretty cool. The Predator is pretty much sculpturally the same as the larger one in the first series, but more pre-posed and with a few minor differences. He's missing the back armor and shoulder cannon from the first figure, but he still has the garish forearm blades that, in the film, were only used briefly by the Chopper Predator. Still, it's pretty darn cool to see all the detail they could pack into such a tiny figure. Paint is surprisingly good for such small figures. The Queen isn't quite as metallic as the prototype shown, but the dark blue with black wash looks nice enough. There's not a whole lot of paint to speak of on the Queen, but most of what is there works well. Curiously, the lower jaw piece is molded from clear plastic and painted blue. This was a feature utilized in the face of the MM6 Queen to show off the clear teeth, but here it makes no sense, as the teeth are painted silver. The Predator looks great, with lots of different colors and no real bleed or smudging anywhere, which must have been difficult on delicate areas like the mesh netting that covers most of his body. Articulation is one feature that inhibits playability in most of the offerings in this series, but the Queen is one notable exception. It's the closest thing to a genuine action figure in this line, featuring a balljointed "face", a mid-neck hinge (hidden by the rubber neck), a peg at the base of the neck, balljointed shoulders, a balljointed chest, balljointed hips, and a bendy tail. The Predator doesn't fair nearly as well, and is more typical of the average articulation level in this series: he features a hinge at the top of the neck, a peg joint at the base of the neck, a peg joint at each bicep, and a balljointed chest. It's not much, but at least it's not a statue. Each figure comes with a base, and they connect together to form a scene in which the Queen and the Predator face off. Unlike most "interlocking" McFarlane bases that simply connect by being next to each other, these bases actually lock together via small connectors included with the Queen. 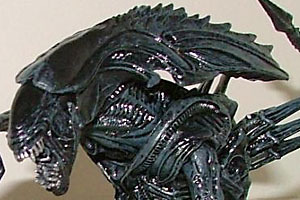 Her base is understandably smaller, since she's such a comparatively large figure, and it features three closed alien eggs which are obviously and disappointingly based on the larger scale eggs McFarlane has included on previous figure bases, right down to the wavy line around the middle where the larger eggs could be pulled apart. In this small scale, however, it's just a useless (and rare) break in the sculpt. The Pred's base is larger and comes in two pieces that are excruciatingly difficult to fit together. Obviously an attempt to appease fans who were upset that prototype bases were not included with the figures in the first series, the base is an extravagantly detailed section of the Predator Temple from AvP, and it features a number of human skulls and spines lining the walls as well as a strung up, cocooned human victim. The temple floor features an opened egg and a dead face-hugger. As was mentioned previously, both figures plug into the base by way of large, metal pegs that stick out of their feet, rendering the figures useless when not connected to their bases. When these two pieces are connected, the effect is rather nice, and you get a pretty decent little diorama. Still, I have to question the change in scale, particularly because other companies have already created much more articulated and playable AvP figures in this scale (most notably the Hong Kong Snap Kits and Takara's upcoming Micromen). However, I suppose it's worth noting that McFarlane's offerings are still by far the most accessible in the U.S., and these dioramas give you plenty of scenery for your more "action"-oriented action figures to "play" in. Scale change: yay or nay? Tell us on our message board, the Loafing Lounge.